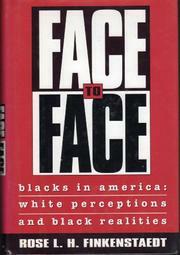  A book by a white scholar claiming special insight into ``black realities'' promises to be either brave or presumptuous. Face-to-Face, a foggy and unfocused exploration of the role of racism in American cultural identity and economic order, inclines toward the latter. Finkenstaedt, who has a doctorate in the history of ideas, argues that racism has been the single most defining force in American culture and society. But her book is replete with highly questionable and unsubstantiated assertions. Finkenstaedt states that ``it is the blacks alone of all ethnic and national groups who have been intentionally deprived'' by white Americans--a claim that many Native Americans, Japanese-American internment camp survivors, and 11th-grade US history students will find outlandish. Also unsupported is her statement that ``white women...have never been oppressed.'' When Finkenstaedt does attempt to back up her claims, she isn't very convincing; for instance, she justifies the contention that feminism and black liberation movements have always ``worked at cross purposes'' by pointing out that suffrage leader Susan B. Anthony was racist. Passages devoted to literature and to the sexual bases of racism are more competently executed, but even these are weighed down by unexplored conjectures and a tendency toward crude reduction. Finkenstaedt's prose is incoherent at points, a problem that is not helped by the book's overall lack of direction. Face-to-Face is further burdened by an excessive and unproductive reliance on secondary sources; often, rather than providing evidence to support original ideas, Finkenstaedt merely recycles the opinions of better-known scholars whose views she shares. Though clearly well-read, she rarely breaks new ground. It is unlikely that these particular ``white perceptions'' will greatly advance the reader's understanding of black, or any other, reality.